We’re excited to be working with Stadium Apps to develop their Venyoo app using the ArcGIS Runtime SDK for iOS. The ArcGIS Runtime SDK for iOS is Esri‘s native Objective-C API for deploying maps, geocoding, routing, and spatial analysis capabilities to iPad, iPhone, and iPod touch devices. Venyoo has beautiful maps, created in ArcGIS for Desktop and rendered as tile packages that can be included in the app download. 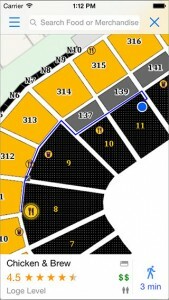 In other words, the maps work offline while the user is inside the venue without GPS availability. Venyoo brings together the robust offline mapping capabilities offered by the ArcGIS platform with iBeacon technology to provide the user with contextual information as they move about the venue. Beacons are a low-cost piece of hardware, small enough to attach to a wall or countertop, that use Bluetooth Low Energy technology to transmit a signal similar to WiFi. Each beacon broadcasts a unique signal that can deliver personalized, micro-location based notifications and actions to any smart device within its range. Venyoo uses beacons to solve the indoor routing challenge. By placing beacons strategically around the venue (in each seating section, at concessions, rest rooms, stairways, exits, etc.) a sensor network is created. Venyoo can recognize which beacon is closest and provide accurate navigation instructions. Less time trying to find your seat or where to buy fries means more time enjoying the game. 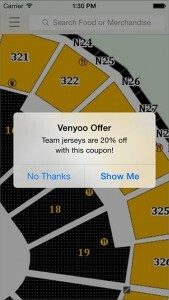 When an event goer walks into a merchandise establishment, Venyoo will notify them of specials or coupons. 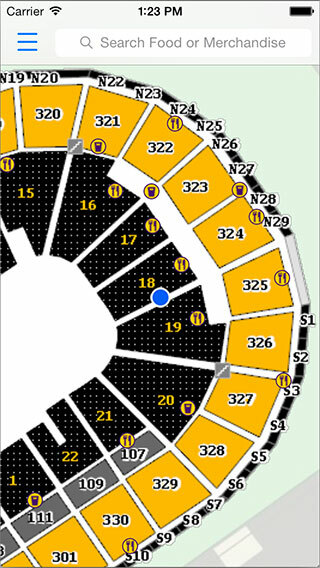 While standing in line at a concession, Venyoo can crowd source the line size and display this information on the map. While exiting the stadium after the game, Venyoo can deliver a thank you message along with a schedule of upcoming events. The more we work with the iBeacon technology, the more use cases and opportunities we identify. So far, we’ve integrated the beacons from Estimote, which are quite attractive looking and a breeze to work with. Next we will integrate the Gimbal beacons by Qualcomm. We’re also exploring ways to take advantage of the Esri’s ArcGIS Geotrigger Service to enhance the Venyoo experience. For example, geotriggers could be used to save battery life by turning the iBeacon ranging on/off when entering/exiting the venue. But beacons may already have a rival in the Smart LED Lighting systems from Philips and ByteLight. It will be interesting to see how this fast moving area of technology plays out.